THE recent demonstrations in the country were not a local affair but a way by Western countries to camouflage their goals on Zimbabwe and the African continent in general, Presidential spokesperson Mr George Charamba said yesterday. It emerged yesterday that three African states namely Zimbabwe, Sudan and DRC were supposed to fall within a week as part of United States’ aggressive plan against the continent. The US announced last year that it is instituting a new policy for Africa with an aim of checkmating Russia and China. Russia and China are using their investment and trade to forge strong ties with African governments. Mr Charamba, who is Deputy Chief Secretary to the President and Cabinet (Presidential Communications), said the recent demonstrations which were instigated, organised and managed by MDC Alliance and its affiliate non-governmental organisations should never be mistaken for local politics. “Yes, the face was local but the politics were external,” he said. “Locally, it does not make sense let alone a coherent narrative to at one level suggest that Zimbabwe is over 80 percent unemployed while in the same vein creating a dummy called Zimbabwe Congress of Trade Unions (ZCTU). “Surely 80 percent unemployment and you still have a labour movement, it just doesn’t add up! “This level of cheap propaganda is an insult to the intellect of Zimbabweans who know better. The thing belongs to the MDC and the MDC leadership, to the man and woman must pay the price for the dead, injured and all the looting that took place. “Another contradiction is that you can’t at one level suggest that this is a ZCTU-organised violent demonstration while at the same time you are investing in that same violent protest, a key grievance of the MDC namely that the President must resign or that he must create a Government of National Unity. What has that to do with an employee in Lobels? You have a mismatch between agency and message and where you have such a discordance the rule of the thumb is clear namely that you should follow the message then you know who the agency is,” he said. 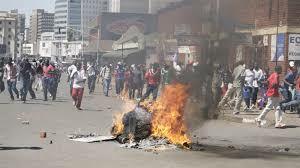 Mr Charamba said the agenda for the demonstrations far exceeded bread and butter issues. He said going beyond MDC Alliance and its double Trojan horses (ZCTU and NGOs), at the heart of the disturbances is a sinister conspiracy combining Western interests. “That plan is continental and is predicated on reshaping the politics of the African continent to make them useful to western imperial interests. “Three States should have fallen within a week namely the Sudan which was been suffering rolling demonstrations, Zimbabwe whose own act drew inspirations from developments in Sudan and DRC where the electoral process was meant to be aborted in favour of a preferred candidate. The comparison with Zimbabwe is direct. “We have elections in Zimbabwe, which are won by Zanu-PF and confirmed by the Constitutional Court on one hand and then we have elections in the DRC which are won by (Felix) Tshisekedi and are about to be confirmed by the highest court of that land yet there is a spirited attempt to abort the rule of law in favour of an extra democratic and extra legal settlement that favours Western interests,” Mr Charamba said. He said the developments have to be understood in the context of the new American policy towards Africa. The new policy was announced in mid-December last year by US President Donald Trump’s security advisor John Bolton. “The core focus of the policy is checkmating Russia and China in the African continent, itself the last frontier of natural resources,” he said. He said the Americans expected the November 2017 political changes to see Zimbabwe moving away from nationalism and giving pride of place to Western interests as opposed to Sino-Russian interests. The Americans, he said, also expected the new administration to placate white farmers by adopting a new policy of total compensation including for the land as well as abandon the policy of indigenisation and empowerment. “There was an attempt to appropriate Operation Restore Legacy and make it an instrument of the realisation of Western geo-strategic interests,” he said. “The West is furious because the new dispensation is proving brittle.” In respect of land, President Mnangagwa has insisted that he will compensate them in terms of the Constitution and instead of dropping the Look East Policy he has in fact broadened embracing Eastern Europe and Euro Asia. “More specifically against a happy story of new diamond finds, the President has put the Zimbabwean interest at the heart of exploitation of those diamonds only accepting foreign participation by way of select companies from Russia (Alrosa) and China (Anjin). This is a smack in the West’s face,” Mr Charamba. “Equally, the Darwendale platinum project is set to take off and all this in the eyes of the West is an abomination more so to the Americans with their so called new African policy. So the calculation in the West was to instigate unrest in the country in the hope that Zimbabwe security forces would overreact.